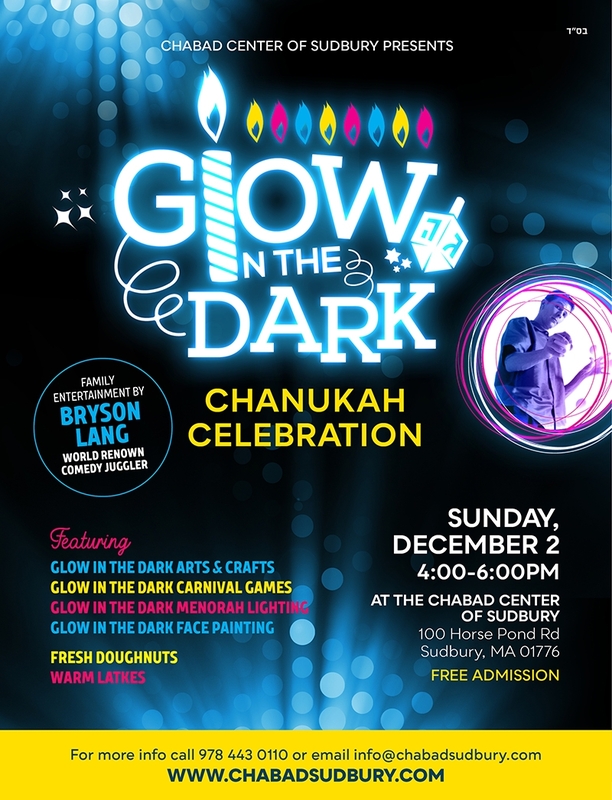 The Chabad Center of Sudbury invites you to join us for an awesome Glow in the Dark Chanukah Celebration & Show. Featuring an awesome show by Comedian Juggler Bryson Lang and a Glow in the Dark Theme to the Arts & Crafts, Games, and Ambience, the event is sure to be a memorable celebration that will be a great start to Chanukah for you and your family. Help us light up a Nine Foot Glow in the Dark Menorah and kids get to enjoy their own Chanukah Light up Necklace! Of course we will have an abundance of Donuts and Latkes and other refreshments as well as some great Chanukah Music. No Charge / Donations to Chabad of Sudbury welcome. Consider being a Chanukah Dreidel Sponsor for $180, a Menorah Sponsor for $360 or a Macabbee Sponsor for $500 and help support the many Chanukah programs we bring to the community at large. RSVP by using the form below.